Northbrook, IL, Feb 08, 2018 (GLOBE NEWSWIRE) – Digital Check’s ReceiptNOW Elite teller receipt printer is now available in an Ethernet-compatible version, allowing it to be controlled over an in-branch network. The new addition means that all current-generation SmartSource teller scanners now have network-enabled receipt printers available. The printer can be addressed either over a network via Ethernet cable, or through a standard USB connection. As a result, banks and credit unions that expect to use networking in the future will be able to use the new ReceiptNOW Elite within their current teller environments, then reconfigure it to run on a network later – without the need to purchase new equipment. The network-enabled ReceiptNOW Elite can also be used either as a modular device stacked with a compatible SmartSource Elite scanner, or as a standalone printer independent of any particular scanner or workstation. The Ethernet-enabled printers will also be backward compatible with non-network versions of the SmartSource Elite scanner, accommodating a limitless variety of possible branch configurations. ReceiptNOW printers are designed to stack underneath their corresponding scanners, saving counter space and providing a matching, modular look. By employing thermal print heads rather than inkjet cartridges or dot-matrix ribbons, they operate at much higher speeds than comparable inkjet devices, while using no consumable supplies other than paper. 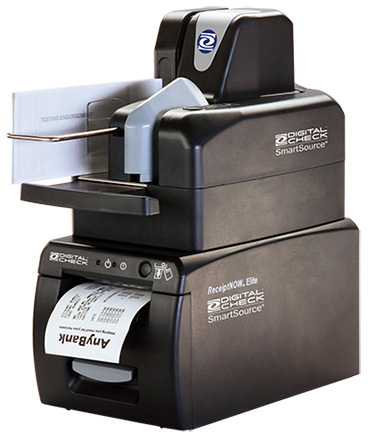 The original ReceiptNOW printer, which pairs with the SmartSource Professional and Expert scanner lines, gained network capability in 2011. For more information about the ReceiptNOW Elite printer, or about SmartSource’s network check scanning options, please contact your Digital Check account representative or call (847) 446-2285.